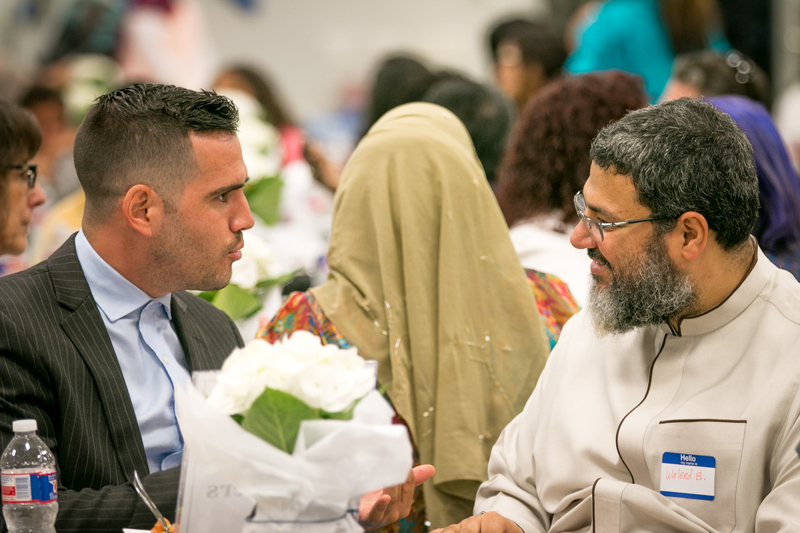 I had the pleasure last Saturday of breaking the fast with the Clear Lake Islamic Center, the Muslim American Society, and other members of their communities at an annual Ramadan gathering in Seabrook, Texas. I was invited by my friend Dr. Mohamed Shalaby, who asked me to speak on Prophet Muhammad’s model of integration and how this model relates to our current time. One thing I noticed when I arrived at the podium was the diversity of the crowd. There were Christians, Jews, people of all “races,” and of course Muslims of various ethnic backgrounds. I started my 15-minute talk by asking those in attendance, “What do we as members of a society do with the diversity that surrounds us?” I asked the audience to consider “diversity” through the prism of three sociological concepts: segregation, assimilation, and integration. Segregation is relatively straightforward. Segregation means that society is divided into concrete camps and that groups in a given community have little-to-no cross-cultural interaction. This kind of societal division can be either voluntarily or coerced. Assimilation is the idea that an individual – be it a migrant, immigrant, or anyone really – should leave behind their “homeland” culture once they arrive to the new host society. To assimilate into a new society also suggests that an individual has adopted the norms and way of the dominant group in that given society. Integration transcends the stark divisions of segregation and moves beyond the call to adopt the cultural ways of the dominant racial and ethnic groups in society. Integration allows an individual to maintain their way of life while the host society finds ways to fuse the practices and values of the minority communities into other ethnic and religious communities. Successful integration means that an individual has a sense of belonging to a community and feels that they are generally free of persecution. Integration is a term that has been discussed by prominent thinkers over the course of history. Emile Durkheim, one of the “Godfather’s” of sociology, discussed integration in light of solidarity and how members of a community can foster a sense of social cohesion. Although Durkheim is considered one of the “founders” of integration theory, we would be wise not to forget that Muslim scholars were considering this concept centuries before Durkheim was even alive. Ibn Khaldun, a sociologist and historian of North African descent who lived in the 14th and early-15th century, examined integration through the Arabic term asabiyya. Khaldun analyzed integration by looking at the lack of social cohesion and unity in pre-Islamic Arabia, a time when tribalism and clanism dominated Arab society around the modern-day Middle East. Khaldun also talked about asabiyya by focusing on a sense of shared purpose and mutual dependency between members of a given society, regardless of how religiously or ethnically diverse the society might be. O mankind! We created you from a single pair of a male and a female, and made you into nations and tribes that you might get to know one another. Surely the noblest of you in the sight of Allah is he who is the most righteous. Allah is All-Knowing, All-Seeing. One of the examples that I stressed in the speech is the Constitution of Medina, a treaty that Muhammad had entered with many Jews and Pagans. In Medina, warring Jewish tribes invited the Prophet of Islam to settle their disputes, as they were in need of a leader who could mediate and rule on issues pertaining to justice. The Jews were given religious freedom as well as protection of their heritage and culture in the Constitution, which is also called the Medina Charter. See more discussion of the Constitution of Medina on Oxford Bibliographies. This spirit of equality and justice are echoed in the Covenants of Prophet Muhammad with the Christians of his time. These extraordinary documents consist of a set of treaties that Muhammad had entered with Christians. Under his rule, Christians were provided freedom of religion, freedom of conscience, right to private property, and political autonomy. The main conclusion that I shared at the end of my speech concerned our understanding of the terms “Ummah” and “American.” Who is part of the Ummah? I encouraged people to consider Prophet Muhammad’s approach to integrating religious minorities under Islamic rule and compare this approach to militant groups such as ISIS. On the other hand, I raised the question of what kind of nation do Americans want to live in. I suggested that we all focus on fostering civic national values and citizenship rights instead of exclusive notions of American identity based on race, ethnicity, and religion. I have stressed over and over on this website and elsewhere – Islamic values and American values are compatible in many ways including the vision that Prophet Muhammad and the Founding Fathers had for the Ummah and the U.S. 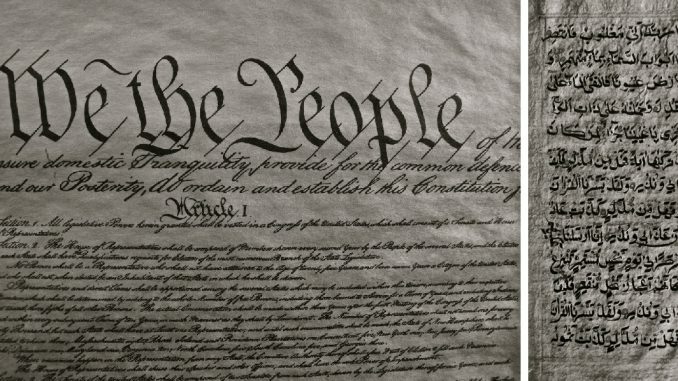 While we can certainly focus on the differences between Muhammad and the likes of Washington and Jefferson, we would be wise to consider how they might be kindred spirits.